(Photo by Darren Andrew Weimert) Lloyd and Marilyn Niemann have been married nearly 65 years. 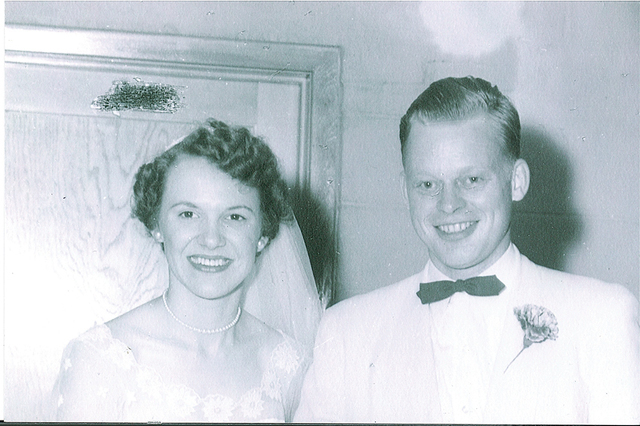 Lloyd and Marilyn Niemann on their wedding day. As of late last year, the U.S. divorce rate was 39 percent. Meanwhile, nearly a fifth of Americans are currently considering divorce, according to a 2017 study from legal resource Avvo. It’s no wonder then that some members of younger generations might have a less than optimistic outlook on love or marriage. So, when you find a couple that’s been together decades, even above and beyond their diamond anniversary (60 years), it begs the question – what’s your secret? Resoundingly, when talking with couples in long-lasting relationships around the Centre County area, the answers are much the same: work hard at your marriage, stay dedicated to the relationship, be supportive, be selfless, realize that your spouse is not perfect and that’s OK.
“Part of it is the ability to talk about things, the ability to forgive and to laugh, to say, ‘Gee, I’m sorry. I didn’t mean to do that,’” says Elaine Schuckers. The two moved to State College in 1963 for Dave’s position at Penn State, where he retired as the assistant to the president for governmental affairs. They settled into the community, bought some property, and built two homes in the Waddle-Julian area, one for Dave and Elaine and one for Dave’s parents. The family did largely all the work themselves, and the couple says the project is a testament to their strong familial ties – another thing that they feel positively contributed to their decades of marriage. 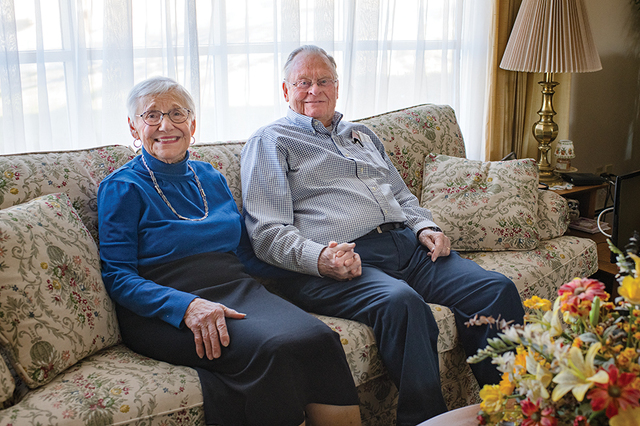 Family is a sentiment echoed by Herb and Nancy Graves of State College, married 69 years. The two met at Penn State, through their respective fraternity and sorority. Herb and Nancy would meet daily to chat, and occasionally so Herb could accompany Nancy to the Rathskeller. (“As a girl, you didn’t go in alone,” explains Nancy.) They frequently fixed each other up on dates, until, one night, Nancy says Herb walked her home and left her with a kiss at the door. It was Nancy’s mother, however, who immediately predicted the two would end up together. “The first day [my mother] met him she told me, ‘Now, he’s the man for you.’ We were at [my] home. … He went in and she was making bean soup. [First] we were outside and there were a bunch of people there. The football players from Penn State [came over]. Herb went in and started stirring my mother’s bean soup and that did it. She said to me that night that he was the man for me,” Nancy says. “I wanted to get away from all these guys who had just stopped to say hello to Nancy. So I left the room and went out into the kitchen and stirred the soup,” Herb chimes in, laughing. “And got my mother’s attention,” Nancy agrees. The two would go on to get married, have their first child of four within 10 months, and begin moving around the country for Herb’s work in engineering, even living in Puerto Rico for several years. They acknowledge all this movement made for some stressful conditions. “We had hard times in life and hard times between us. Making our marriage work sometimes under strained, stressful conditions, it’s easy for us to see why so many people get divorced. We had days where we didn’t talk to each other, but somehow we worked through it. Over the years, things just got better and better and better,” Herb says. “We knew we wanted to work it out when we had problems. Sometimes it took time to do it. Any married couple that’s moved around a bit knows the stresses that come with such an undertaking, including Lloyd and Marilyn Niemann, married nearly 65 years. The two grew up together in Lincoln, Nebraska, before moving more than half a dozen times and finally ending up in State College, where they’ve remained for the last 53 years. “I sat behind him in high school in study hall and we never ever said one word to each other all that time,” Marilyn notes. “He went to the Merchant Marine Academy in New York after he graduated from high school. I was at the University of Nebraska. His cousin was my roommate,” she says, explaining the story of their later, more official meeting during Lloyd’s trip to visit his cousin. “I was going over to the student union at night and he says, ‘Oh, I’ll walk along with you because my car is on the way.’ His car was right [out front] and I knew [it]. He … asked me to go out to a dinner dance the next night. … My goodness, when it came time to dance, he swirled me around on the floor like I couldn’t believe. That’s how it all started. The two were married two years later in a large wedding and then began their journey around the states, “picking up some children along the way,” Lloyd adds. As they acquired more belongings and more children, the moving was a stressful challenge, but he says they always were able to recognize the reality of their situation and adjust, with a little bit of love and companionship. The theme of these successful couples trotting around the country and the globe continues with Harry and Martina Campbell of State College, married 59 years. Martina moved all the way from Germany, following Harry through his military career. After the official business was over, Martina says Harry just keep returning, gaining the approval of not only her little brother and her very particular dog, but her parents as well. Two years later, the two were engaged and then married in 1959 before moving to the United States. Martina notes that Harry never “officially” proposed; “we just knew,” she says. Following the marriage, the two moved around a lot, but Martina doesn’t view this as a big challenge in their marriage. Family also played a large role in the Campbells’ marriage. Martina says that Harry’s parents welcomed her with open arms and taught her everything about life in America. She also says that her parents, who were very happily married, set an example for her early on. Along with the good qualities many of the couples reference as the key to a long-lasting marriage, it seems a good dose of faith doesn’t hurt either. Drew and Dianna Fenstermacher, for example, met while both on mission trips to Lima, Peru. Drew was teaching at a school for missionary children, while Dianna was participating in a six-week summer program through her college. When Dianna left Peru and Drew stayed behind, they kept in touch, writing weekly letters for the next six months. After Drew moved back to the States, he popped the question a week later and they were married in seven months. Holly and Ed Ketz’s advice from their 45-year marriage is similar, with a stress on Christ-like love. “By love, I’m not referring to the kind of love that’s portrayed on television or the movie screens. I’m talking about the kind of love described in 1 Corinthians 13. If you really look at the chapter … it talks about patience, kindness, not keeping a record of wrongs, persevering, bearing all things,” Holly says. The two are proof that even marriages that begin under the most stressful circumstances can flourish with the right outlook and attitude. Holly tells the now-charming story of their wedding: “We wanted to get married at Virginia Tech at the War Memorial Chapel and finances were very tight because I was paying for the wedding myself. I had brought my sewing machine from home in order to make my own wedding dress. I had to be out of the dorms by graduation day, and we could not afford a motel room, so we booked the wedding for graduation day. Because the War Memorial was a very popular place to get married, they were all booked until 9 p.m. that night. We booked it for 9 p.m. My mom came from Ohio for the wedding, but because it was also graduation day, she couldn’t get a local motel and had to stay an hour away in Roanoke, Virginia. The couple would go on to face a few difficult, lean years, living in Virginia and Connecticut before making their way to Centre County. Through tight budgets and a colicky baby, a broken leg and ill parent, the couple has leaned on each other, and on their faith overall. With all these couples finding their way together and their ways through life differently, it’s certain there’s no one roadmap to love, but one thing is definitely for sure: no matter how you get there, a long-lasting marriage is well worth the effort.